This flavorful beef rib eye - or ribeye - roast is coated with coarse black pepper and thyme, and then it's topped with a mustard and horseradish sauce mixture. Serve with baked potatoes and tossed salad. Use an oven probe or meat thermometer or check the roast periodically with a reliable instant-read thermometer. This simple rib eye roast is an excellent alternative recipe with garlic, salt, and pepper. Or try this recipe for an herb-crusted beef top loin. 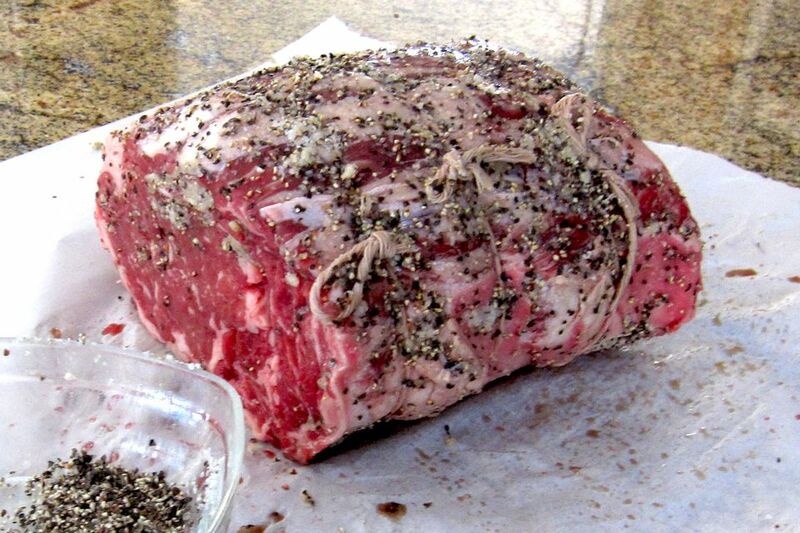 Combine the kosher salt, coarsely ground black pepper, and thyme; rub over all sides of roast. Place the roast, fat side up, on the rack in the roasting pan. If using a meat thermometer or oven probe, insert it into the center of roast. Or use an instant-read thermometer to check the roast periodically. Roast the rib eye roast at 350 F for about 1 hour. Combine the Dijon mustard and horseradish; spread over the beef. Roast for 25 minutes longer, or until roast is about 135 F to 145 F (on ​an instant-read thermometer or meat thermometer) for medium rare to medium. Roast to about 150 F for medium-well.